My favorite dessert is pie. Especially during the holidays. I love homemade pies, but honestly, I have a love and fondness for frozen creme pies. See… my Mom was/is a great cook, but she never was much into baking. She passed that onto me, by the way. I remember her buying Edwards Crème pies for Thanksgiving and Christmas (other occasions, too). It’s a tradition. A yummy tradition! So when I heard that Edward’s Desserts is donating $1 to Toys for Tots for every pie purchased during the month of November and December. Well, it just confirmed why I love ’em! And what’s not to love about something so quick and easy that tastes like homemade? I know, right? Edward’s Desserts is also helping to spread the cheer this holiday season by letting you send a holiday e-card to family and friends. 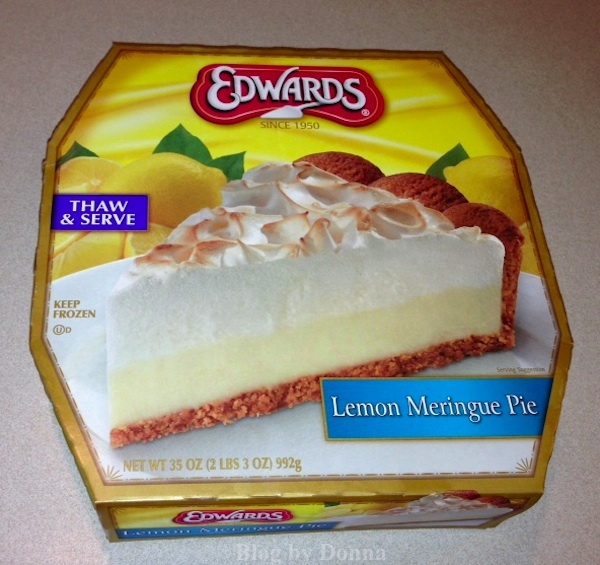 By sending an e-card you and your recipient will be able to print out a coupon for a free Edward’s Dessert Creme Pie. I sent mine, and it was super quick and easy. I bought the Lemon Meringue Pie to take to my mother-in-law’s for Christmas Eve. Edward’s Hershey®‘s* Special Dark® Crème Pie is my personal favorite, but several family members that will be at the Christmas Eve party would prefer the lemon meringue pie. So lemon it is. I have something for one of YOU, too! I have a coupon for a free Edwards Dessert’s Crème pie and Edwards will also make a $20 donation to Toys for Tots in the winner’s name! Giveaway open to US residents ONLY, 18 years and older. Ends 12/20/12 at 11:59 pm EST. Just enter on the Rafflecopter form below. Good luck! Remember for every pie you buy a $1 will be dontated to Toys for Tots. And send a holiday e-card to get a free coupon for yourself and your recipient, now! I’d get it for my husband and he likes any of the chocolate ones! The chocolate one would be great at my house! Thanks! Lemon Meringue is the one I try because I love this type of pie. Thanks! Don’t want to try any one . . We KNOW the lemon is AWESOME!& would love a free one.! I would like to try the Reese’s Creme Pie!! I want to try the Boston Cream Pie. I love the chocolate creme pie the best! I am most interested in the turtle pie. I would get the turtle pie. I want the Strawberry Creme Pie!!! I would love to try the Reese’s Cream Pie. I love Edward’s Hershey®‘s* Special Dark® Crème Pie. I would love to try the Lemon Meringue Pie! It would be a hard decision given the variety, but I would probably ultimately walk away with the Reese’s. The Turtle Pie for sure!! Yummmyyy! Key Lime for my husband. I want to try the Hershey’s Special Dark. The Hershey Creme Pie looks so good!